Dr. Desmond Ford’s friends were very appreciative when the Avondale College Council voted to hold his Memorial Service in the College Church. I for one was elated at this mature spirit of grace. The South Pacific Division’s belated decision to withdraw that permission dismayed many because of its pettiness and narrow mindedness. I personally was shattered at this reversal. However, by general agreement no mention of this unfortunate incident was allowed to mar the spirit of the memorial service. Once I entered the lecture hall and heard the beautiful music of Lyell Heise (keyboard) and Gabriel Ontanu (viola), my troubled soul was soothed. Among their selection was Des’ favorite hymn, Charles Wesley’s “Depth of mercy, can there be (Mercy still reserved for me? 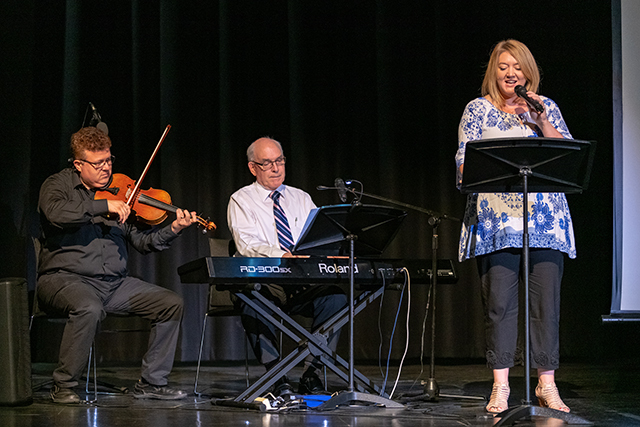 ).” Then in the service itself the congregation of 500 or more, aided by the superb voice of Marian Moroney, sang “Amazing Grace (My Chains are Gone)” and followed it with “It is Well with My Soul.” Des’ former student, Graham Stacey, led the congregation in prayer. The theme of “grace” permeated the whole service. 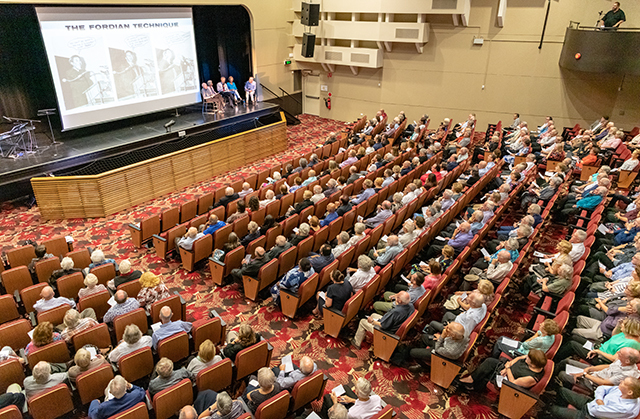 Professor Ray Roennfeldt (President of Avondale College of Higher Education) commenced “Avondale Remembers Des Ford” with a welcome that combined pathos, humor, and tears. 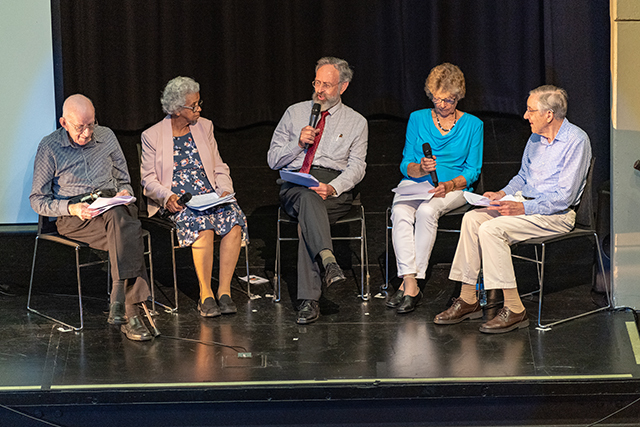 A panel ― moderated by Dr. Lynden Rogers and consisting of former college colleagues, Dr. Laurie Draper and Dr. Trevor Lloyd, his first student secretary, Gwen Maharaj (Ramswarup), and Joan Patrick, former Dean of Women ― gave us personal glimpses of Des during his sixteen years lecturing in the Theology Department of Avondale College [of Higher Education]. Then Dr. David Tasker, another former student and currently lecturer in Avondale Seminary, provided a vivid picture of being a student of Des’ in the 70s. As a former student, colleague, and friend, I offered a homily, which I dedicated to the memory of Des, of whom I said, “though he is dead, he still speaks” (Hebrews 11:4 NASB) through his former students and all those who were overwhelmed by the gospel of the grace of God in his Son, Jesus the Christ. Des emphasized that receiving God’s gift of grace meant one received the Giver and that the resultant relationship impacted on one’s ethical behavior. The relationship was always a gift, unearned and unearnable, but it also always impacted on the values by which one lived. The congregation responded appropriately when I pointed out that the Apostle Paul was not compliant, since he added the plural form “daughters” to his quotation of 2 Samuel 7:14 in 2 Corinthians 6:18. The theme of the homily was superbly set by Marian Moroney’s prior excellent rendition of John G. Elliott’s “Embrace the Cross,” and beautifully concluded with Dr. Robyn Priestley’s thoughtful benediction. Most of those in attendance felt that Des had been given a warm, fitting, moving, and loving farewell. Norman H. Young is a Seventh-day Adventist Christian theologian and New Testament scholar. He recently retired as senior lecturer at Avondale College in New South Wales, Australia. Photos by Bevan Craig, courtesy of the author. Undoubtedly the most brilliant SDA theologian ever, Des challenged the Church to become more Biblically oriented and to follow the “Sola Scriptura” principle to base its doctrines on. Unfortunately his call was rejected. Sad. The South Pacific Division’s belated decision to withdraw that permission dismayed many because of its pettiness and narrow mindedness. When it is considered to be safer to humiliate a dead SDA than to engage with them alive, “SDA Leadership” is less than an oxymoron. There has never been more of a good reason to buy Desmond Ford’s Glacier View document to learn what still rattles the nerves of such unworthy leaders. Thanks Spectrum for keeping the flame alive…”though he is dead,yet he still speaketh “. Would we all have the courage to listen and heed. Always take the high road even to those who profess to be God’s “chosen people,” no matter how right they want to be. Let their behaviors betray their gospel. There has never been more of a good reason to buy Desmond Ford’s Glacier View document to learn what still rattles the nerves of such unworthy leaders. I have insisted on this for almost 40 years now, that people should read his GV book. If their conscience is not compromised, they will see the light. Or not. At least they would have examined Des’ original work. I did it, almost 40 years ago, and had not doubt on it since. I decided to accept his Biblical position. Yes, let’s not scorch the “truly remnant,” let them keep showing us the fruits of their religion. Norm, I woke up this morning feeling fine. Then I read your article. Now I’m feeling grumpy. I want to disassociate myself from Gerhard Pfandl’s view. I think it is an incorrect comparison. In the life sketch I adopted the biblical view of sanctification, not Pfandl’s Wesleyan view. Pfandl wrote that sanctification is Christ’s work in us through the Holy Spirit and sanctification changes us into the likeness of Christ. Therein lies the seed of perfectionism and Adventism’s Achilles heel. Des taught me to do word studies of key biblical words like “sanctification.” Starting with Young’s Concordance (was he an ancestor of yours?) I discover that “sanctification” simply means “to set apart” from the secular for a sacred use. In the life sketch I said that the word “sanctify” carries no hint, either linguistically or contextually, that it means to improve one’s character towards perfection. Exodus 29, for example, mentions the sanctuary was sanctified. Pray tell me, How can an inanimate object like the sanctuary acquire moral qualities such as fidelity and honesty, starting with an imperfect character and progressing up a moral ladder towards perfection over decades of use? The idea is absurd. Sanctification does not mean a progression into the likeness of Christ, despite what Pfandl or anyone else says. Modern Bible translations depict sanctification as a once-off consecration service. It applied to the priests as well as the sanctuary. The Aaronic priests were sanctified at their consecration service. They did not become more righteous as they grew older, finishing up in a near perfect or perfect state. Now I’m off to my nap. Maybe I will feel less grumpy when I wake up. Whether it was at Avondale College or Newcastle didn’t seem to make much difference to the crowd. I know many of them came and hugged me and told me their stories about Des’s personal interaction with them or their parents. He changed many people’s lives for the good. He cared deeply for the denomination and spent much of his life outside the gates still ministering to them—despite the cuffs and rebuffs some loved to send his way. He was able to forgive his enemies in an amazingly transparent way. A life to admire. I know I did. And all because he focused on the love of Christ and would not be distracted. He appealed for all to focus on the message of God’s forgiveness, unlike some whose whole religion seems to be the pursuit of identifying the beast. Some of them are like their father; they don’t have a heart. So, “What is at the core of Adventism?” is the thought-provoking question we are now confronted with. Now, I share this today because it is becoming apparent that our church is being affected by unchristian forces which are welling up from within. Caveat emptor. Kyrie eleison! I was also there. How could I miss saying good bye to my very dear mate. It was a very spiritual journey. Thank you to all those who supported this cheerful day. Let us go on carrying the cross of Christ of which we are so unworthy. For those who oppose such an event, I can only say how sorry I am for you. "God, look at Your people! Look at those who have wrapped themselves in Your religion like a cloak of hypocrisy. Look - are they Your people? On their spattered banners, bombastic slogans, and rolling banter, do You see or hear beauty? Does there labour carry the fragrance of Your breath - do their acts resonate mercy and bliss? Is the bliss of Your touch found in the misery of their follies? Can the agonies they spread, and the suffering they inflict possibly represent Divinity?.. No, they are not your people for with certitude and conviction, I know that Your people are known by the love they earn, not by the hearts and minds they mutilate and burn, as they convince themselves that they are the bearers of your Majesty.’ Adapted from “Search for Beauty in Islam”. K.A E. Fadl’s Theological Masterpiece. It should be noted that all the photos were taken by my friend Bevan Craig, who has skills I can but envy. Thanks, @Norman_Young, we’ve updated the article to reflect this. Gillian, you are correct, Des changed peoples lives only because of the Jesus he upheld and the peace that his preaching (and lifestyle) gave someone who was lost. Yes I am saddened by the acts of the venue being changed, but then again small minds think on small things. Des’s mind thought on the biggest thing ever, Jesus, and Jesus Only. God Bless you Gill, and Family. Thank you, Milton. This distortion of the biblical meaning of sanctification within Adventism has long bothered me, too. Use the word transformation, or growth in grace…but not sanctification. Growth towards perfection or even progressive experience is not what it generally means. Including the examples you cite, there is also the idea that Paul addressed his congregations as saints…holy ones. As they were. Including a mess of a church like the Corinthians. This reflects the majority view in the NT, that sanctification was a status that is conferred immediately upon joining up with Christ and his people that signifies belonging to him, for his purposes in this world. This clearly undermines the Adventist, eisegetical usage of progressive sanctification. I’ve had my nap and woke up feeling grumpier. But then I read Frank’s contribution.and now I feel much better. Frank is correct in saying sanctification is a status conferred when we join up with Christ. I said in the life sketch, “In the NT sense sanctification (Gk. hagiasmos) happens at genuine conversion when one is set apart as a member of the priesthood of all believers with Christ as one’s High Priest.” That applies to all converted Christians, male or female, rich or poor, black or white, old or young, enslaved or free. And, yes, Frank you are correct in saying that the sanctified ones, those set apart from the secular at their conversion, can be called “saints.” They remain saints, not because of any good works, but because daily they claim the covering of Christ’s righteousness and thus are justified by faith alone. Des preached under the banner of “Justification by Faith Alone, in Christ Alone, by Grace Alone.” The Wesleyan banner is “Justification by Faith with a Generous Pinch of Works” and that forms the basis for legalism and perfectionism. It is often infected with elitism and a judgmental spirit and a press for compliance to a long list of behaviors. I discover that “sanctification” simply means “to set apart” from the secular for a sacred use. In the life sketch I said that the word “sanctify” carries no hint, either linguistically or contextually, that it means to improve one’s character towards perfection. Exodus 29, for example, mentions the sanctuary was sanctified. Pray tell me, How can an inanimate object like the sanctuary acquire moral qualities such as fidelity and honesty, starting with an imperfect character and progressing up a moral ladder towards perfection over decades of use? The idea is absurd. Sanctification does not mean a progression into the likeness of Christ, despite what Pfandl or anyone else says. Modern Bible translations depict sanctification as a once-off consecration service. It applied to the priests as well as the sanctuary. The Aaronic priests were sanctified at their consecration service. They did not become more righteous as they grew older, finishing up in a near perfect or perfect state. I really appreciate this new (to me) explanation of the term "sanctified, sanctification’. This makes so much sense. The Fruit of the Spirit is the evidence of our changing and growing in the New Birth process. This fruit (love, joy, peace, patience, kindness, goodness, faithfulness, gentleness, self-control), would seem to be the type of change, or growth that would lead to the changes that would be evident in every area of our lives. Plus, we don’t produce the fruit, it’s the HS. [1 Corinthians 6:11] And that is what some of you were. But you were washed, you were sanctified, you were justified in the name of the Lord Jesus Christ and by the Spirit of our God. Here is the positional use of the word sanctification in the Bible. It puts sanctification and justification as happening in the past. They are in essence equivalent terms. Sanctification is the sanctuary term. It means set apart for holiness. Justification is the law court term. It means declared righteous (based on the acts of another). The Reformers spoke of Christ’s active and passive obedience. They meant by this that Christ offers us both his atoning death and his righteous life. He is both substitute and representative. In the divine exchange (2 Cor 5:21), we get Christ’s righteousness, and he gets our sins. Thus, our position before God, as we accept it by faith, is perfect and covers us all our days. Churches often use the word sanctification as Christian growth, but as pointed out in these discussions, this is a different use to the one I am talking about. At the same time our standing with God (justification) and our state (common use of the word sanctification) are never separate. The first brings the second. If there’s no Christian growth, we must question whether the gift has been received.